Some wonderful puzzles here from Ed Southall on Solve My Maths. Ah we all love a good puzzle. I’ve spoken a few times about my love of them, and it’s kind of inferred by almost everything on this website. 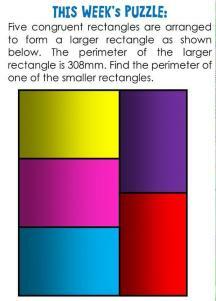 There are some great maths puzzles. Not only do they excite students in a way that perhaps no textbook page can, they also make you think. I don’t think any good puzzles can be done just by applying a mindless algorithm to a familiar looking structure. I could write a billion words on puzzles so I’m going to have to be more specific. In my mind there are two kinds of maths puzzles.